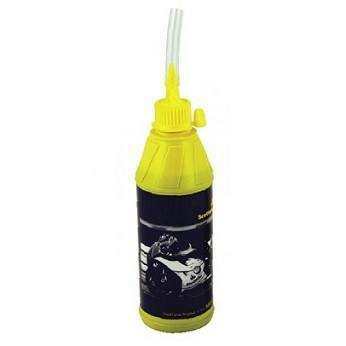 Scottoiler are leading manufacturers of automatic motorcycle chain lubricating systems. Our range of Scottoiler systems & accessories includes something for every rider whether you ride on or off-road, helping to prolong the life of your chain and sprockets by up to 7 times. Giving you the peace of mind that your chain won't dry out or excessively wear because you forgot to oil it yourself! Scottoiler parts for individual systems also available upon request. The Dual injector Add-on for Scottoiler systems allows even more efficient and effective chain lubrication by splitting the oil flow at the chain, meaning both sides of your chain are properly oiled. Highly recommended by users of Scottoiler systems! 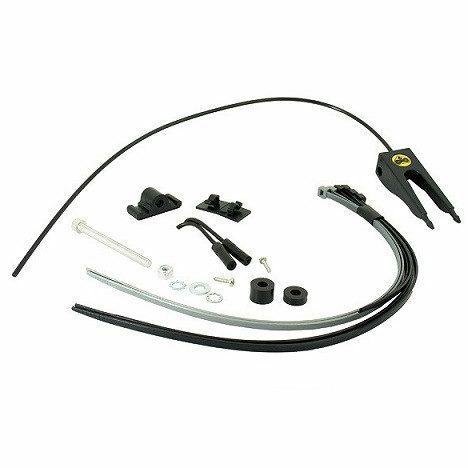 Dual Injector kit includes parts required to fit to most bikes. To find out if the Dual Injector is compatible with your bike check out the bike specific installation guides. Accelerometer reading in G Force. Oil level gauge & low oil level warning. Ambient temperature reading with consistent flow rate regardless of temperature. Increases chain & sprocket life by up to 7 times. The ultimate automatic chain lubrication system, giving you peace of mind, extended chain & sprocket life, and more time out on the road! The Scottoiler Honda Africa Twin kit is specifically designed for use with the Africa Twin model from 2016 onwards. A Vacuum-operated automatic chain lubrication system provides your Africa Twin with reliable chain oiling as you ride with the feed of oil increasing as your engines speed increases. Access and adjustment were key considerations during the design process of this Scottoiler kit which features special fittings making it easy to install and mount on the Kawasaki range. Supplied with a 250ml bottle of traditional Scottoiler blue oil. The Scottoiler KTM Kit is designed to fit on most KTM motorcycles including their Street range and all LC8, RC8 and 690 LC4 engines. Designed to fit discreetly on your KTM, featuring KTM orange colouring to make it less visible when mounted externally! The KTM kit will allow 500-1000 miles of riding between oil refills, Scottoil original chain lubricant is included with the kit and will fill your reservoir with plenty left over for future re-fills. 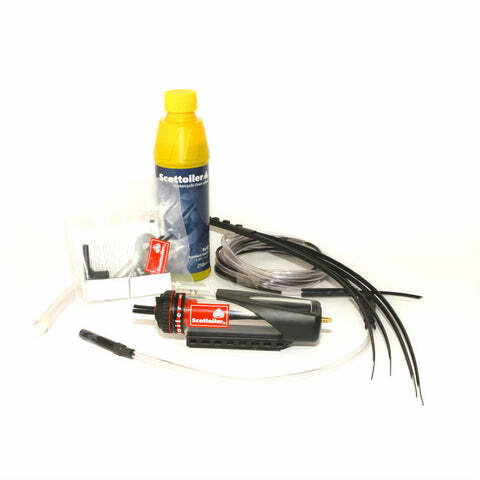 Each kit includes everything you need to get your Scottoiler automatic chain lubrication system set up. It's simple vacuum operation system means your chain will stay lubricated at all times while you ride, meaning you and your chain can go for longer, problem free! This simple extra for your current Scottoiler V-System or E systems offers an extra 200ml oil capacity to your system, meaning a 2000-3000 mile range is guaranteed! With it's flexible design, can be tucked in anywhere there is deadspace, simply with supplied fitting parts. 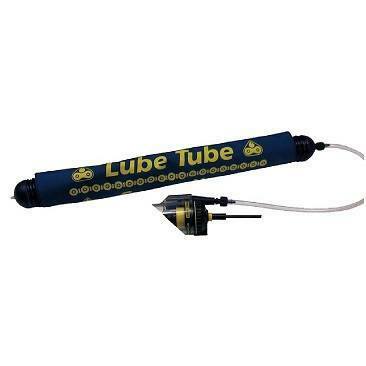 The Lube Tube is the perfect accessory for a touring holiday, commuting or simply for longer time between oil fill ups. Dimensions: Diameter 35mm, Overall Length 375mm. 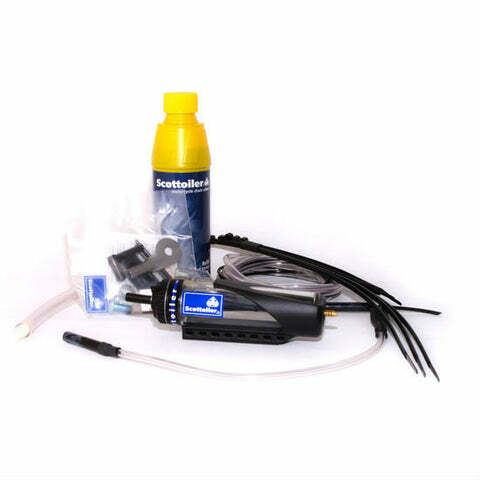 The Scottoiler Suzuki V-Strom kit is designed specifically for use with the Suzuki V-Strom DL650 & DL1000 models. A Vacuum-operated automatic chain lubrication system provides your Suzuki with reliable chain oiling as you ride with the feed of oil increasing as your engines speed increases. The Traditional Scottoiler 'blue' grade oil is designed for ambient temperatures from 0 deg Celsius to 30 deg Celsius. 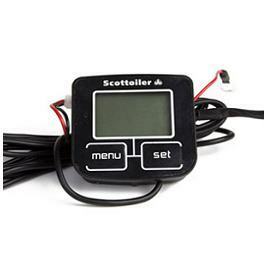 Easily refill your Scottoiler with the supplied spout and be back on the road in minutes! The Original Scottoiler automatic motorcycle chain lube system! With a universal fitment, easy installation and refill, the Scottoiler V-system provides you with total peace of mind whilst riding by keeping your chain properly lubricated through out your ride. 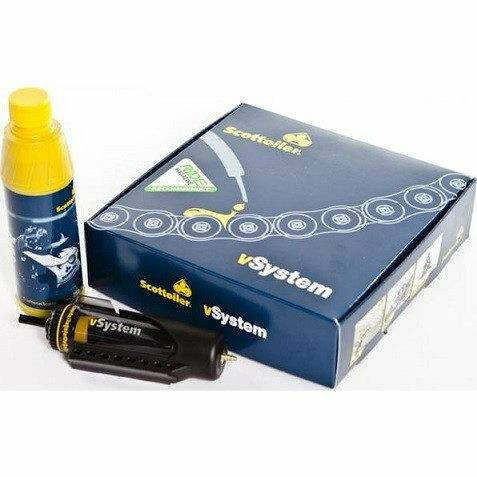 Using a simple vacuum pipe from your engine, the V-System pumps the appropriate amount of chain lubricant directly to your chain through the spout, allowing oil to reach your whole chain and extend its life span. The Scottoiler V-System SportEdition is a vacuum operated chain oiler which automatically lubes your motorcycle chain while you ride. Sport Edition is perfect for the sportsbike rider who wants the same reliable Scottoiler performance but is doing less mileage per ride, or has limited space for the standard vSystem reservoir. The V-System Sport Edition will provide on average, 500 miles of riding with a full RMV. Which provides you with the luxury of a full day of riding then putting your bike in the garage and your feet on the couch without having to worry about doing more chain maintenance before the next ride. No more daily chain maintenance and an extremely discreet installation with the new vSystem Sport Edition! 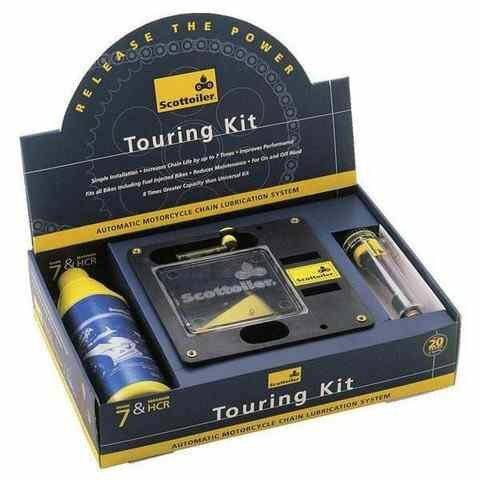 The Scottoiler Touring Kit is based on the original V-System, providing the same reliability and functionality, just with even more features making it the perfect accessory for touring holidays, or simply longer rides! 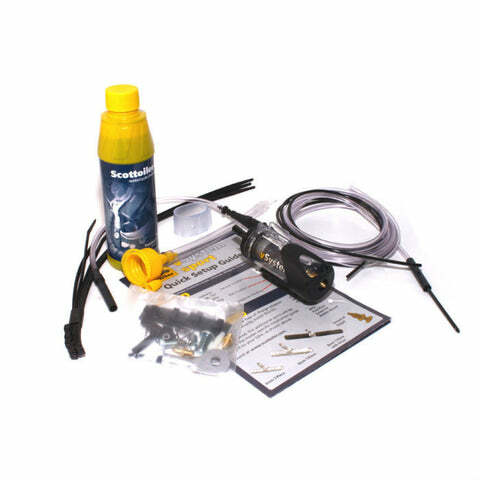 The Touring kit includes everything you need to set up a fully automated chain lubrication system, plus a 250ml bottle of Scottoil traditional Blue Oil for optimal chain lubrication between ambient temperatures of 0-20°C (32-68°F)! 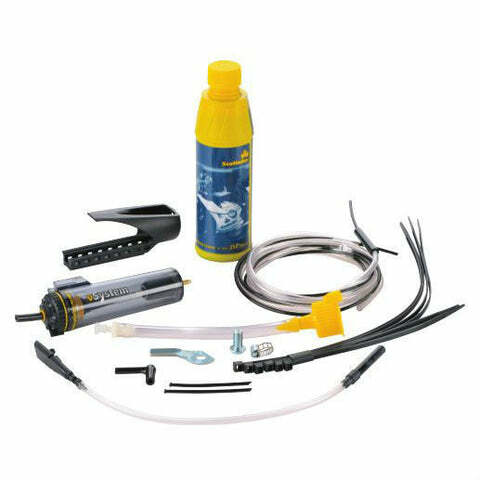 Whether you are going on a touring holiday, or simply want to get more miles between refills, the V-System Touring kit is the ultimate accessory for your bike. Keeping your chain healthier for longer and you on the road for 1000s of miles, problem free.